It’s taken 8 long years, but Rockstars first original title to be released on this current generation of console is finally here. The pressure was on from the start, we all expected a title worthy of Game of the Year at a bare minimum. What we got is not only one of the most authentic and best looking games of all time, but a game worthy of being listed amongst the greatest computer games ever developed. Red Dead Redemption 2 is, quite simply, a masterpiece. Van der Linde’s gang of outlaw misfits have got themselves into some bother. The details aren’t exactly clear, but what is clear is that survival is top of the priority list. The year is 1899, the era of the outlaw is coming to an end, lawmen and bounty hunters are hot on the trails of our main protagonist Arthur Morgan and his men. The gang are divided, some are dead, dying or missing, the only thing separating the rest of the gang and the hangman’s rope is 12 inches of snow. Its sounds dramatic, doesn’t it? Sadly, the first couple of hours of Red Dead Redemption 2 were anything but. To say the start was slow would be an understatement. Early objectives have you searching for food, supplies and injured gang members; it’s a fairly linear instruction, one that drip feeds you the games controls and systems. Thankfully, like all things in the world of Red Dead Redemption 2, the presentation is fantastic. From the jaw-dropping graphics to the truly mind-blowing voice acting presented to you in cinematic cutscenes worthy of the big screen, Rockstar start off this story strongly. Set 12 years before the events of the original Red Dead Redemption, you play as Arthur Morgan, an outlaw who has known nothing but, and has been with the same gang since he were a child. That gang—The Van der Linde gang—has just botched a heist in a town called Blackwater, leaving behind not only fellow gang members but also their spoils. Stuck on a snowy mountain, the gang must survive not only through the winter, but from the many human threats looking to render them extinct. After the snow has began to melt and the wounds from wolf bites have scabbed over, our band of merry men and women can be unleashed on the world Rockstar has so expertly crafted. I can state now that this is by far the most detailed and fantastic looking game world ever created. The sheer scope of the world that’s being revealed in front of you makes your first moments of freedom truly mind blowing. Wildlife graze in the distance, stopping and raising their heads when sensing danger; NPC characters on horseback approach with real caution, befitting the time period – are you friend or foe? 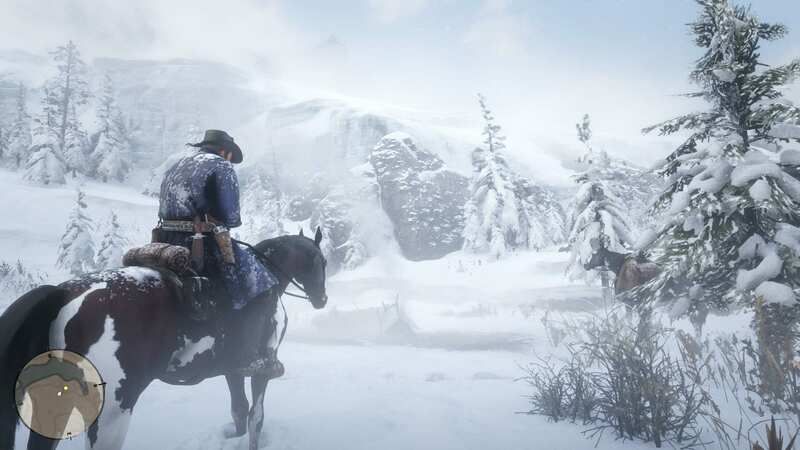 ; Arthur himself sits perched on his horse, not as a character in a computer game, but as an experienced lawbreaker who’s seen it all. The world here is as vast as it is beautiful, with a game map so large that even in its partially covered state it still lets you know this is going to be one hell of an adventure. 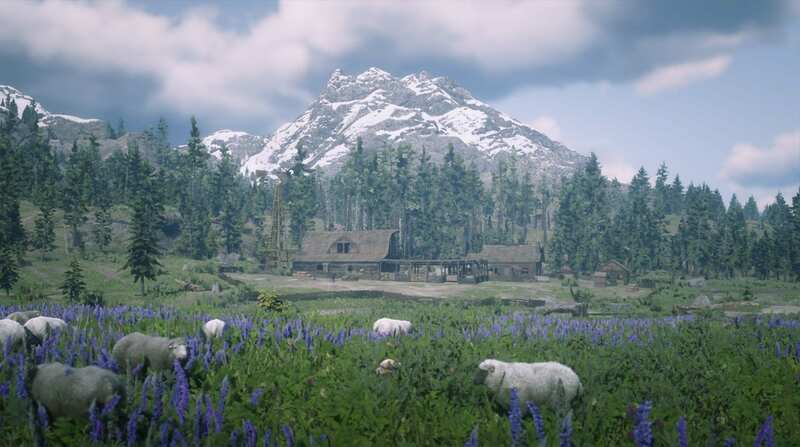 The variety of locations makes each new area discovered an exciting reveal, from mountain tops with snowy peaks to misty forests and lush green farm land. 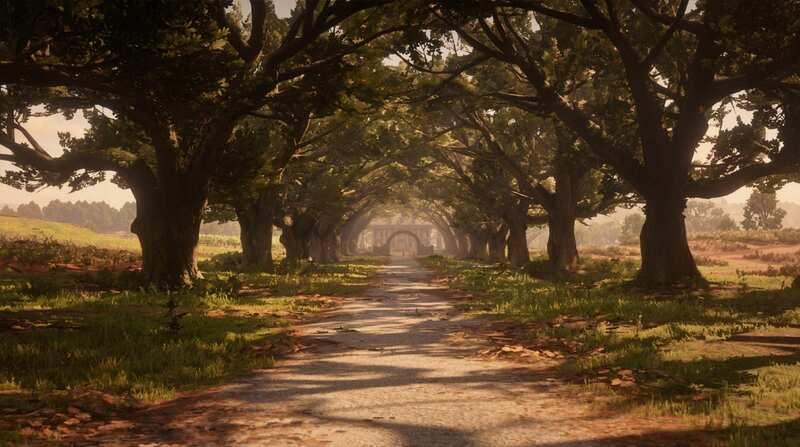 Visiting a new location never once felt like the copy and paste job like we’ve seen in other open world games; each location feels alive and, most importantly, unique. Graphically, this is simply the best looking game I’ve ever played, especially in 4k on a decent screen. Shadows and lighting effects are stunning, with the game offering an impressive colour palette. Most impressive, however, is how the game runs; I’m yet to encounter much—if any—slow down or sluggish frame-rate. I was, however, playing on a PS4 Pro, and won’t comment on performance from an original PS4. Animations are also hugely impressive; with a game as detailed as RDR2, animations play a major role in immersion. Thankfully, every action in this game has an animation linked to it, whether it be something simple like looting a corpse or removing a fishing rod from my saddlebag, to more complex horse-riding and jumping animations, everything looks perfectly believable. Talking of animations, one of the new systems that has been added to RDR2 is animation-heavy. The new ‘core’ system acts as a secondary health, stamina and dead-eye meter for Morgan, as well as health and stamina for your steed of choice. Keeping your core levels high means that your actual meters can recharge, and keeping your core topped up—with actions like sleeping, eating, drinking and taking baths—will mean that Morgan will recover from activities quickly. An empty stamina core, for example, will see Morgan eventually run out of stamina completely and slow down his movement, while an empty stamina core for your horse will see your loyal steed refusing to gallop. 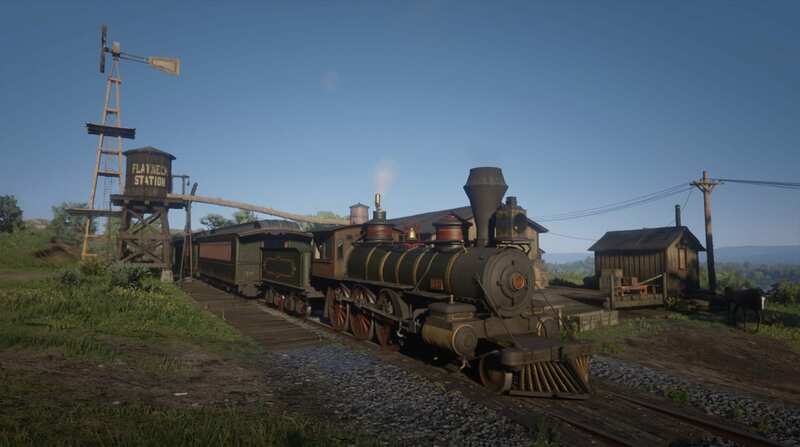 It’s an interesting system, one that adds to the realism of the game and the almost simulation-like gameplay Rockstar are promoting with RDR2. At first, I wasn’t overly keen on the almost mundane tasks being forced on me to keep my cores high. However, after slowing down the pace of my playthrough and taking more pleasure in the finer details, I’ve realised that this system—although no doubt repetitive to some—fits the pace and style of the game perfectly. Being a prequel, parts of the game’s map have been included from the original Red Dead Redemption. Its when revisiting these locations that you come to realise just how far video games have come in the last 8 years. This is an ambitious game, with such bold ideas and so many finer details that, although not always affecting the way the game actually plays out, adds to the feeling of life and authenticity. Redemption 2’s world feels like it never rests, it feels as if these characters will play out their story regardless of whether or not I’m behind the controller. This is a gaming world like no other, so much so that I’ve been tempted to hold the game disc to my ear in search of a pulse. Redemption 2’s world feels like it never rests, it feels as if these characters will play out their story regardless of whether or not I’m behind the controller. Let me give you some examples of these finer details that help bring Red Dead to life. Early on in the game, the story requires you to partake in a bar room brawl; after kicking a fair few arses, the story progresses and you think no more of it. That is, until you re-enter the town a bit later on – you are now the famous brawler, admired by some, feared by others. “I’ve got my eyes on you”, warns the town’s sheriff. You see, events in RDR2 matter, even if not connected to the main story directly. On another occasion, I mistakenly rode my horse into a passer-by; unfortunately, this gentleman didn’t take too kindly to my mistake and drew on me. A few seconds later, he was dead and I was hurrying off. Upon returning to this area a few days later, the residents would holla abuse at me and fear my presence – they knew I was a killer, someone to be feared. Smaller details amazed me, too: injured NPC’s would be seen with bandages the following day, criminals who you encounter could be found in the sheriff’s jail as if paying for their crimes, destroyed buildings/walls would remain that way as a constant reminder of past events, and shopkeepers will remember your previous visits and greet you accordingly. I’m only scratching the surface here; these details exist constantly, every play session I had would surprise me in some way. What’s truly mind-blowing is that Rockstar didn’t need to add any of this stuff, RDR2 would be a fantastic game without it. It’s going above and beyond, something we don’t see very often from developers. Now, let’s switch our attention to something that could have done with a little more innovation from Rockstar – the combat system. Now, allow me to start off by saying that there really is nothing wrong with the combat system, it does its job. Fundamentally, it’s a third-person cover-based system with an emphasis on time-slowing precision accuracy (Dead-Eye) and use of the games magnet-like lock-on system. 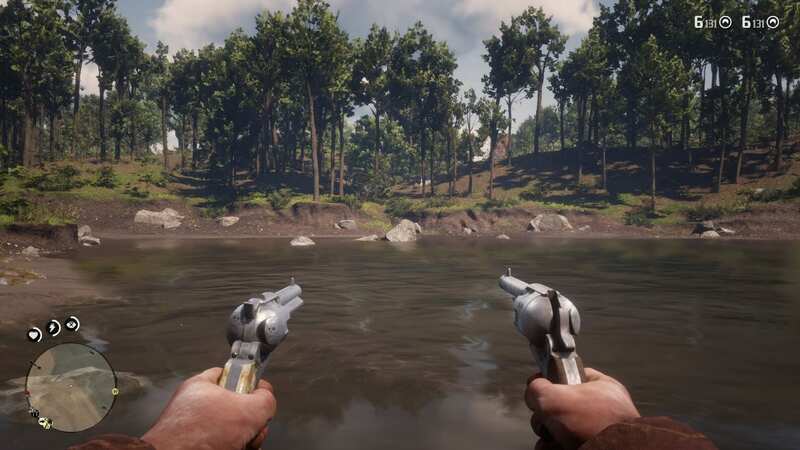 It’s basically the same system as the original Red Dead and bares obvious similarities with Rockstar’s GTA franchise. Dead-Eye now features its own metre with a core system as mentioned earlier; the more you slow down time to pinpoint bullet holes in your enemies, the more the bar draws. Predictably, firing off four headshots on four separate enemies is as satisfying as it was 8 years ago. What’s not quite as satisfying, however, is the auto-aim. Your crosshair will stick to targets with magnetic power, eliminating the need for skill and planning when entering the many shooting set-pieces that the game has to offer. Do I kill the nearby gang members hiding behind that wagon, or switch to my sniper rifle to take out the guy on the rooftop? It really doesn’t matter. With a default lock-on this strong, any enemy at any distance is rarely a challenge. This dated combat system is an area where I’d have liked to have seen some innovation, something that really separated RDR2 from games of a previous generation. Sadly, that innovation is not present, with the consequence being that the combat system in RDR2 is one of the weakest portions of the game. With a slight adjustment (namely turning off auto-aim and upping sensitivity), however, the combat system is improved; our very own Ricky has a guide available on how to setup your control options to maximise enjoyment in combat. It’s an interesting read, providing a good alternative for the default settings – check it out here. Combat can be a bit stale but can be played in 1st or 3rd person. Changing settings can also help combat be a bit more fluid. Elsewhere, the game controls well. Horses gallop at speeds dictated by their stats, and they (realistically) get more difficult to control the faster they move. Wagons and larger carriages have larger turning circles than horses and require that little bit of extra care when riding them. From rowing a boat to jumping behind the ‘one-button-press’ acceleration of a train, everything here feels tight enough that it never becomes a concern. Having said that, controlling Arthur can, at times, be a little frustrating, especially in tight spaces or when seeking cover behind smaller objects. It’s not a deal-breaker, but it feels a bit clunky at times, for want of a better word. Where RDR2 shines brighter than most is when you actually get to play it. By that, I mean when you have an objective, when something needs doing and Arthur is the man tasked with the job. The slow pace of the game really accentuates these activities, with the downtime between story missions serving as an opportunity to self-promote. 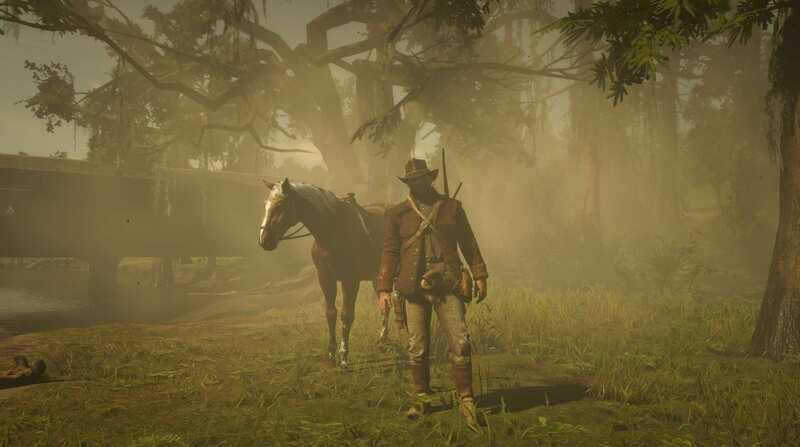 Riding into a gunfight on a newly tamed steed, fresh shaven and draped in the latest in general-store fashion has never felt so good. It feels as if Arthur is progressing as the story unfolds, and you—the player—are in full control of that progress. So, I’m suited and booted (quite literally) and ready for whatever the wild-west has to throw at me. Let’s begin with the main story. The variety of activity here is outstanding. Yes, most missions will have us firing a gun at something, but the sequences leading up to any showdown involve both fantastic storytelling and a definite reason for a climax (stop laughing). At no point did I feel that I was pressured into drawing my pistols for the sake of it. Every story-arc, every set-back and celebration was either deserved or earned. Story based activities felt like a continuation of my freedom rather than a linear activity played through by millions. That variety and freedom with these activities will see you completing everyday tasks like fishing or hunting with familiar faces from your camp, robbing trains, hunting down adversaries and breaking comrades out of jail. If you can think of an activity that an outlaw may have partaken in that isn’t included in RDR2, I’d be amazed. Freedom of choice rears it’s more-than-welcome head from time to time, with options given that include continuing certain activities or decisioning who in your gang does what. An example of this would be a mission involving a fishing trip which took a more sinister turn; when those extra-curricular activities had been completed, I was given the option to go fishing as planned or to wrap-up the mission. It sounds simple, but in a world that promotes freedom, these small choices keep the player immersed in both character relationships and within the world. Side-missions also feature huge amounts of variety. Although some of these tasks can be repetitive in nature (think bounty hunting and debt collecting), there is enough variety and storytelling that they never stop being entertaining. Will the farmhand pay what she owes? Or will her boyfriend pull a gun on me? Everything you do is an unknown; the world and the characters in it beautifully unpredictable. Almost every side quest Arthur partakes in is for the paper, to quench his thirst for dollar bills. It fits his character perfectly. Yes, when meeting a former lover, maybe Arthur agrees to help out for sentiments sake, but generally speaking, if something needs doing, there better be a reward or you better be paying. Money is important in RDR2, but what you decide to spend that money on is up to the player for the most part: clothing, haircuts, fast-travel, bounty fees, and gambling are just a few examples of what you may decide to spend any fortune on. Thankfully, most key items are found for free when completing quests, items like guns, ammo, food and tonics, for example. Having this freedom with your finances makes playing RDR2 feel like a simulator at times. This isn’t a bad thing at all, and adds depth to the whole ‘roleplay’ experience. I’d often find myself simply having a whiskey and playing a hand or ten of poker in a saloon after a near-death experience in a shoot-out that same day. Also adding to the RP experience is the honour system. It’s a fairly basic system that we’ve seen in many games before; perform an act worthy of gaining honour—like saving an adventurer from a wild animal or breaking up a fight—and your honour bar will raise slightly, while negative actions like killing civilians have the adverse effect on the honour bar. For most of my playthrough I found that my honour didn’t really shift from a more neutral position, somewhere between the halfway mark and ⅔ up the bar. You see, even when consciously trying to be a decent human being in RDR2, accidents can and will occur. Countless times I rode into civilians or got drawn into conflict through no fault of my own. It’s because of this that I eventually gave up and didn’t really pay much attention to my honour unless there was a particular item that I wanted to obtain that required it. Missions and plots go hand in hand in any great adventure, and thankfully Rockstar has, once again, absolutely nailed the storytelling in RDR2. The game is expertly written and boasts over 500,000 lines of dialogue to help tell its tale. Without giving too much away, let me just say that it’s an emotional rollercoaster, with ceremonial highs and devastating lows. During it’s 60-hour-or-so main story, you will see characters personalities change to fit the circumstances they find themselves in. It’s these small yet noteworthy moments which really help to add a layer of polish rarely seen in computer game storytelling. You can often catch members of the cast bemoaning their luck, or with a pint in-hand celebrating a successful heist. Add these smaller background scenes to the bigger picture of the main story and you have a plot that feels realistic enough for the player to have an emotional attachment to almost every character. Speaking of characters, the game features a vast array of them, all with unique personalities and traits that you see repeated on numerous occasions. Impatient killers are impatient killers, with their actions never feeling out of place because of it. During my playthrough, I often found myself trusting certain characters more than others when it came to completing missions or any criminal activities, simply because of how they had behaved during the story. The superb cutscenes and voice acting only cement what is one of the best prequel stories ever told in a video game. 700 actors were brought in by Rockstar to voice RDR2, with a further 500 being used for motion capture. The extent Rockstar has gone to to produce such a cinematic experience pays off in a huge way, with cutscenes almost always being enjoyable and wonderfully animated, and the voice acting only enhancing the immersion. From voice acting to the rest of the games audio, again RDR2 never disappoints. Simple yet satisfying sound effects—like holstering a weapon or the loud echoing boom of a dynamite fueled explosion—sound beautifully authentic. When hunting I would often stand still to listen for the sounds of wildlife before venturing in a direction to catch my prey. With so much detail in the audio, and with so many background noises that could so easily be missed with a poor sound set up, I would highly recommend using headphones to really experience RDR2 in all its audio glory. The music is also fantastic, at times really helping to amplify feelings of danger and discovery. Where the music really shines is when you’re alone in the wild, maybe tucked up next to a campfire; at times I felt like Woody Jackson’s original score was my main companion, a constant support on a long, unforgettable journey via horseback. A living, breathing world that feels like it continues, whether or not you’re holding the controller. A varied cast of unique and interesting characters, brilliantly voiced, who develop as the plot resolves. Feeling of discovery rarely found in video games. Where will the beaten path take you? An emotional, well written story, told by characters you care about. Overly long and somewhat tedious opening few hours. This didn't do what was to follow justice. Combat, although not particularly ‘bad’, still managed to feel like the weakest aspect of the game. Fantastic, outstanding and superb. I’ve used many adjectives to describe my time spent in Red Dead Redemption 2, yet none of them really do the game justice. It’s only when you take a moment to digest what you've experienced after a lengthy play session that you can truly fathom the scale, uniqueness and down right brilliance of what Rockstar has created. I started this review by calling RDR2 “a game worthy of being listed amongst the greatest computer games ever developed” and I’m going to end it the same way. Here, we have a game that will be spoken about and praised for many years to come. A game to define a generation, a story so well told that it could fit the big screen. No, it’s not perfect, no game I've played is, but what we have here is a game that is as close to perfection as can be. For a game this vast, with so much to explore and discover, that in itself is truly remarkable.